I admit to being a sucker for a VW camper van of the sort you can’t buy here in the States. Nissan has unveiled a pair of new camper vans that are going to be available directly from the dealer, at least in Spain. 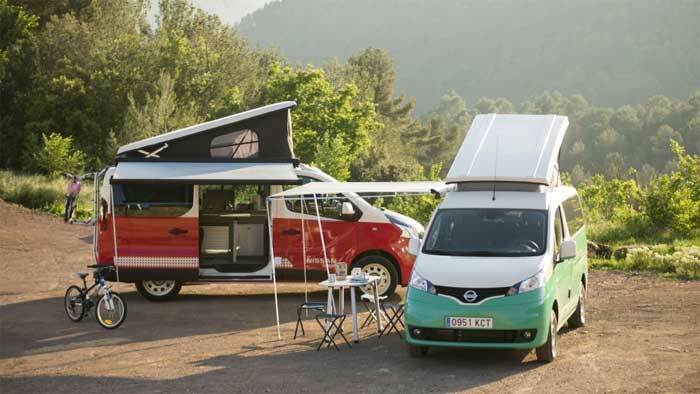 The models are the NV300 Camper and the e-NV200 Camper. Both models have interior and exterior mods that make them suitable to camping. The NV300 interior supports up to four people with an elevating roof and a table. The van offers a refrigerator, sink, stove, water and gas connections. Both campers can be converted to sleeping accommodations with window shades and stationary heating. A second double bed is in the raised ceiling of the NV300. The campers are customizable to suit the needs of the buyer. There is no word on pricing for the campers or if they will be offered outside of Spain at this time. Few details are offered on the e-NV200 other than it is an EV.